This berry toned styled shoot was smoking hot! 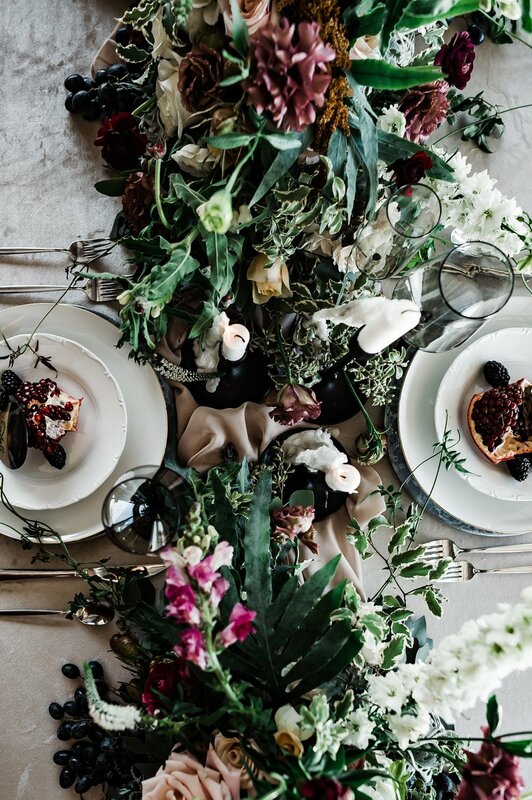 With lush centerpieces, dreamy linens and delicate dinnerware we are convinced you will love it too. The table was set with gorgeous moody details such as customized gold dipped place cards with the prettiest black and gold menus. Our “bride” looked stunning in a Dany Mizrachi gown beside her “groom” in a sleek Friar Tux suit. Her bouquet was a wildly organic hand-tied bouquet in shades of moody plums and creamy ivory! The shoot even featured a smoke machine to maximize the moody romantic feel, how fun! Our favorite part? The furry friend who made an appearance with his very own floral collar!